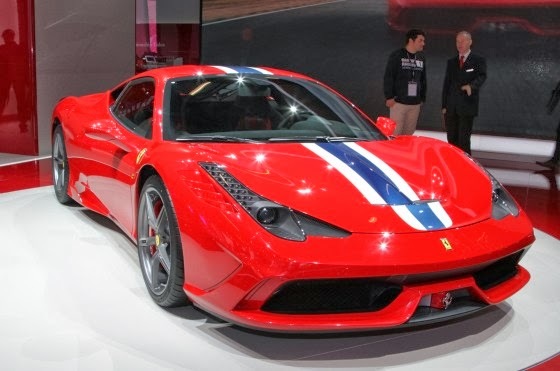 Ultimate version of 458 earns its stripes with 597bhp, 90kg weight loss and a faster Fiorano lap time than a 599 GTO . 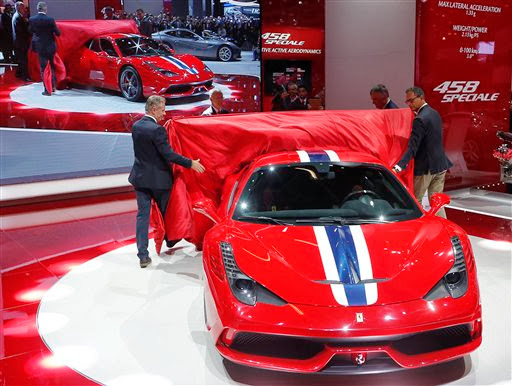 THESE are the first official images of the Speciale unveiled at the Frankfurt Motor Show. And yes, it’s a stunner. There’s never been much wrong with the standard 458 Italia, of course. But Ferrari has managed to boost power, trim weight and improve the car’s already impressive aerodynamic performance. The Speciale will be the ultimate incarnation of the 458, following on from the tradition the company established with the 360 Challenge Stradale and 430 Scuderia. Visually, you’re left in little doubt that you’re looking at the ultimate 458 – even without the full-length body stripe, which we believe will be an (expensive) option. The Speciale gets some serious aerodynamic revisions, including a vent integrated into the bonnet, channels on the outer edges of the front bumper and small winglets on the side sills. At the back is a vast diffuser, and the Speciale loses the 458 Italia’s triple exhaust tailpipes for two wider-bored outlets, one each side of the new diffuser’s tall central element. Ferrari says that moveable aerodynamic surfaces front and rear help balance aero downforce levels – similar in principle to the system on the F12– and claims the Speciale is the ‘most aerodynamically efficient range production car’ in the company’s history. The cabin is stripped, if not spartan. 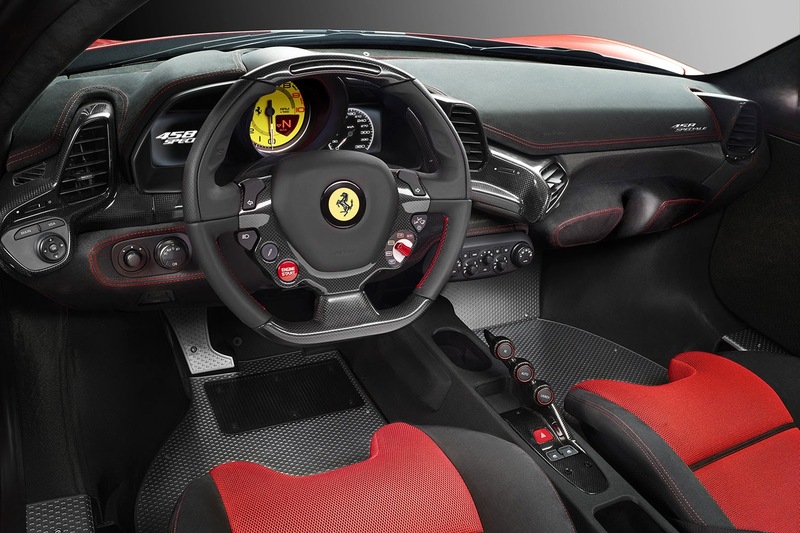 The Speciale doesn’t get an audio system or carpets, but keeps climate control and a stitched part-leather dashboard. Lightweight carbon-framed bucket seats should provide plenty of support, too. 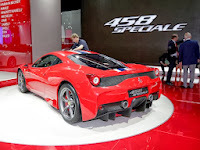 Power comes from a revised version of the 458’s 4.5-litre V8 engine with 597bhp – a 35bhp increase. That works out at a specific output of 133bhp per litre, which Maranello boasts is the highest ever produced by a naturally aspirated road-car engine. It’s enough to ensure the Speciale’s peak power figure runs the 616bhp McLaren 12C – and its twin turbochargers – close. 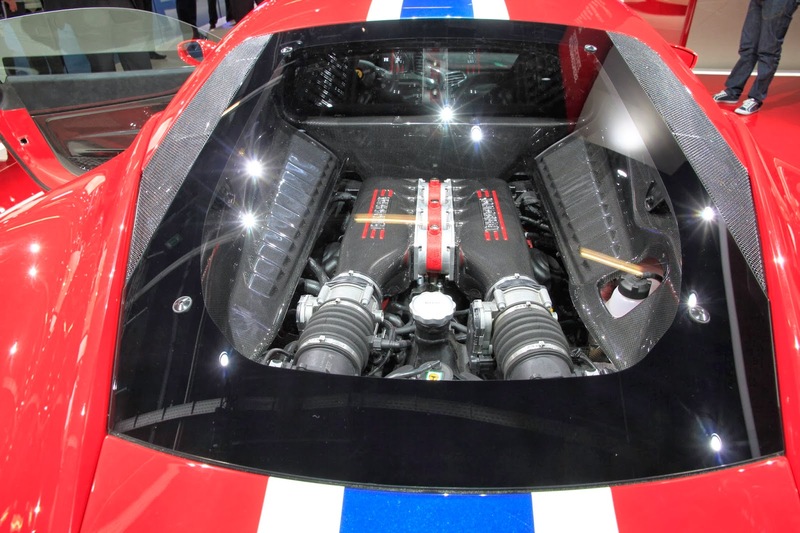 As with the regular 458 Italia, peak power arrives at a heady 9000rpm. – cutting the Speciale’s dry weight to 1290kg. To save you making with the calculator, that translates into a power-to-weight ratio of 470bhp per ton. Ferrari says that the 0-100kmph sprint will be dispatched in 3 seconds dead, 0.4sec quicker than the 458 Italia. We’re also promised a 9.1sec 0-200kmph time. The Speciale gets around a lap of the company’s Fiorano test track in just 1min 23.5sec – just half a second shy of the 730bhp Ferrari F12, but quicker than the mighty 599 GTO by the same margin. The peak lateral grip level – a stonking 1.33G – is claimed to be the highest achieved by any Ferrari road car. – Side Slip Angle Control or SSC. This is a new system that, basically, seems intended to make owners feel like drifting gods. It promises to help a driver maintain a consistent slip angle by managing both the traction control system and vectoring torque between the rear wheels. Or, as the official release puts it, "makes it easier to achieve car control on the limit, therefore greatly improving driving emotions." Sounds like fun, doesn’t it? Yes we do! Agreed with﻿ you! The stripes look awesome and so do the skirts! I hope McLaren engineers are sitting down taking notes on how to make a﻿ good super car. his car has had some good work done on it. Sorry, there's no way that the F12 is as good as this. There's no way the F12 is﻿ as fast as this either. through a few of the posts I realized it's ne&X77; tо me. bookmar&X6b;i&X6e;g it and checking back oftеn!